Viewing the results of the defrags on a Windows Vista computer takes a bit of effort, but it’s worth the effort to check this occasionally to make sure the defrags are running as scheduled. After all, thanks to Windows Vista’s automated approach to the defragmentation process, most of these regularly scheduled defrags happen in the middle of the night or when you’re away from your computer, and you never get to see the results or even whether they worked properly. If you want to see the results of all the defrag runs on your computer, you need to look in the Microsoft Management Console. This console will give you a breakdown of all recent defrags and let you know how things turned out. Unless you check this from time to time, you could have a problem and have no idea. Click Start, right-click Computer, and choose Manage. The Microsoft Management Console (MMC) appears. 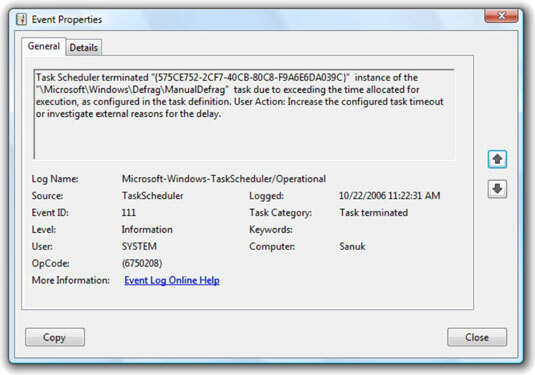 On the left, double-click to navigate down to System Tools→Task Scheduler→Task Scheduler Library→Microsoft→Windows-→Defrag. In the middle, click the History tab. 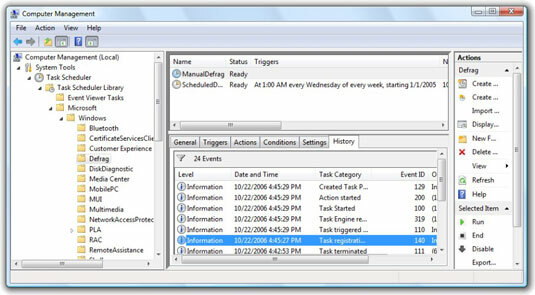 Vista shows you a list of all the events associated with Disk Defragmenter — including manual runs, automatic runs, and rescheduling. To see the details about a particular defrag event, double-click it. Click Close to return to the MMC when you’ve finished looking at the report. A scheduled Disk Defragmenter run took too long to start. For example, in this report, a scheduled defrag didn’t run. If you see many error reports like this one, you should follow the instructions to get to the bottom of the problem. When you’re satisfied that defrags are running properly, “X” out of the Microsoft Management Console. Do you want more control over your defrag runs? Check out Diskeeper, the company that Microsoft turns to when it needs defrag help.